Click here to purchase this music software: compose easily with voice-to-note. Music MasterWorks music editing software: create, play, record, edit and print music with this easy to use music editor. Now with Voice-to-Note. Record from your digital piano/keyboard or use Voice-to-Note and then edit with the quick-key, mouse or touch interface to easily compose music. Choose between a staff or piano roll view as well as a drum track. Create and Print sheet music. 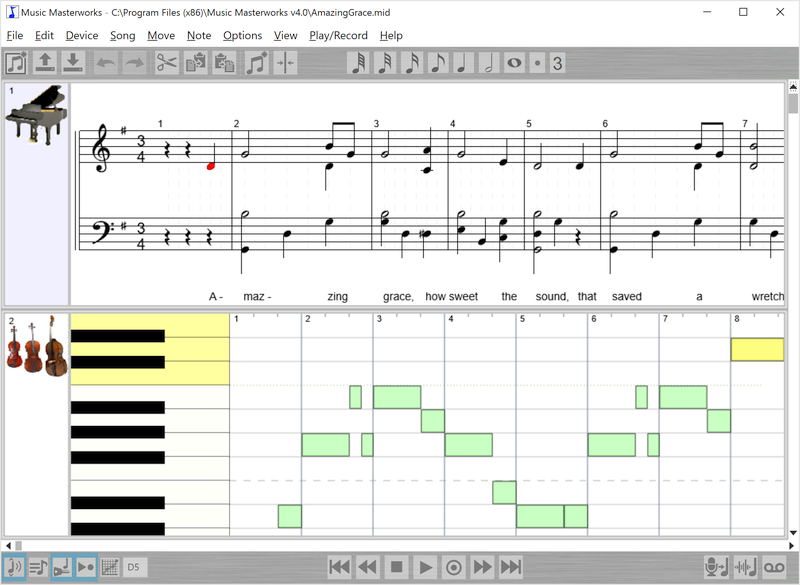 Easy music editing & printing in either staff notation or piano roll scores. Point and click mouse interface to make writing music simple. Voice-to-Note conversion. Just sing into your microphone to create music! 'Basic Mode' so you don't need to worry about the complexities of writing music. MIDI note & audio wave recording and playback. Saves to standard MIDI ('.mid' file) notational format, can be opened in most other music programs. Convert your MIDI notational song to a wave file (so you can burn your song to a CD). Transpose and Quantize your music. Learn to read music with our new 100% FREE educational game: Note Attack!